Moroccan cuisine just got better - thanks to classically trained chef Mohamed Faraji. With thirty years' of interesting culinary heritage you can expect only the best. 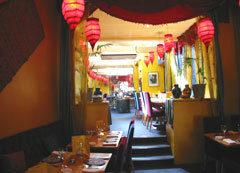 Maghreb’s interior has been exclusively developed to provide you with a memorable eating experience. Surrounded by lots of Moroccan pottery and artifacts Maghreb takes you to the land of mystery evoking a heady and romantic atmosphere and exotic flavours heightened by the delights of Moroccan cuisine. Maghreb offers diners the true richness and diversity of Moroccan cuisine. Beautifully presented starters include Harira (traditional Moroccan soup), Grilled Merguez (spicy lamb sausages), Za'aluk (mashed steamed aubergine with tomato, cumin, chilli, coriander and olive oil) and Goat Cheese Pastilla (a mixture of goat cheese, coriander, cinnamon, garlic, parsley and almond, wrapped in filo pastry and baked). Main courses naturally feature a wide variety of tagines: the traditional slow-cooked Moroccan stew. Mouth watering Spicy fish tagine, lamb tagine with prunes and sesame seeds, aromatic duck tagine with apricot and raisins, and artichoke, broad bean and mooli tagine (vegetarian). Salmon with Couscous Salad, and many more superb dishes that are simply irresistible. Desserts provide a light and refreshing close, with home-made Moroccan desserts, accompanying pastries, pancakes and tropical fruits.